The goal of the Lone Star Healthy Streams (LSHS) program is the protection of Texas waterways from bacterial contamination originating from livestock operations and feral hogs that may pose a serious health risk to Texas citizens. To achieve this important goal, the program's objective is the education of Texas farmers, ranchers, and landowners about proper grazing, feral hog management, and riparian area protection to reduce the levels of bacterial contamination in streams and rivers. While some water pollution is often easy to detect, bacteria pollution is not. 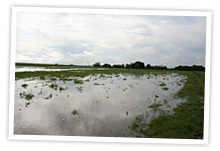 A waterbody choked with algae, a muddy river loaded with sediment, or a lake covered with an oily sheen all exhibit clearly noticeable impairments. Bacteria in water, on the other hand, are not at all noticeable to the naked eye. Did you know that bacteria is the number one cause of water pollution in Texas and that more than half of the water bodies evaluated in the state are impaired because of excess bacteria levels? Bacteria in water can pose a significant health risk to humans. While not all bacteria are harmful to human health, some can be pathogenic, meaning they can cause disease. Waterborne diseases such as hepatitis, cholera, and salmonella can all result from elevated bacteria levels. There have actually been documented cases of illness due to E. coli in Texas waterbodies. Furthermore, high levels of bacteria can indicate that water quality is impaired and that the water is probably unsuitable for drinking and other domestic uses. Sources of bacteria across the landscape are numerous and it is the responsibility of everyone to do their part in helping minimize bacteria and other pollutants from entering our valuable waterways. The agricultural industry can play an important role in helping improve water quality across the state. Simple changes in how livestock and feral hogs are managed can result in significant impacts and can help reduce the amount of bacteria entering Texas streams and rivers, thus protecting the well-being of all Texans. The framework for the LSHS program is five resource manuals that focus on bacterial runoff management for beef cattle, dairy cattle, horses, poultry, and feral hogs. 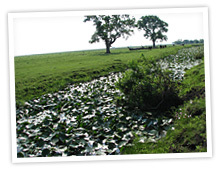 As part of this educational program, current best management practices (BMPs) and novel BMPs are being evaluated to provide important information to citizens regarding BMP effectiveness relative to implementation costs and load reduction. Through enhanced education regarding riparian protection and vegetation management on grazing lands, LSHS will further protect Texas waterways from sediment, nutrient, and pesticide runoff with the concomitant loss of water and topsoil. It is important to note that the BMPs outlined in this website and in the manuals are not mandatory at this time and participation in the LSHS program is voluntary. View the project background or download the fact sheet for more information.